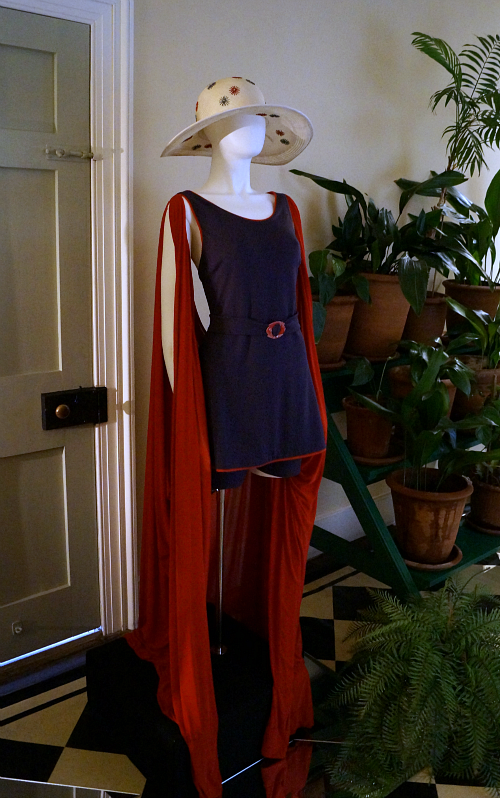 Today I went with some lovely friends down to Old Government House in Parramatta, to see the exhibition of costumes from Miss Fisher's Murder Mysteries. I have to be honest and admit that I have seen very little of the show, and I haven't read the books. I have, however, seen pictures of a lot of the hats and costumes, and I wasn't going to miss the opportunity to see them up close. I knew there would be some good hats, but the first room was FULL OF HATS! It was fascinating to look at them all together. So many cloches, with many of them having the same basic shape, but such incredible variation from the choice of materials and trims. 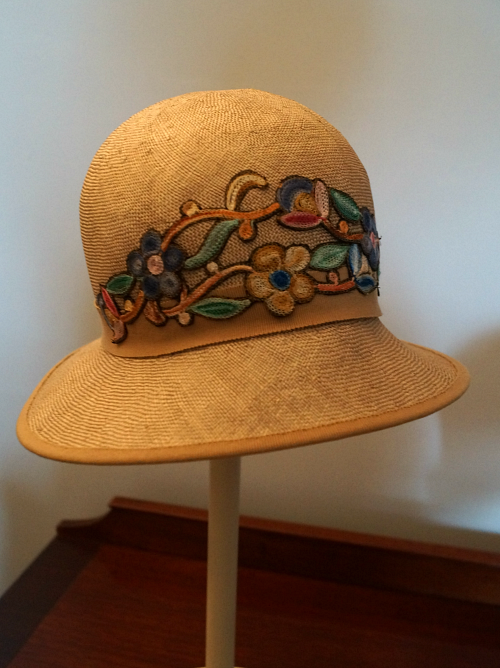 Many of the hats (and dresses) were newly made but used vintage fabrics and trims, such as this straw hat with a genuine 1920s embroidered motif. 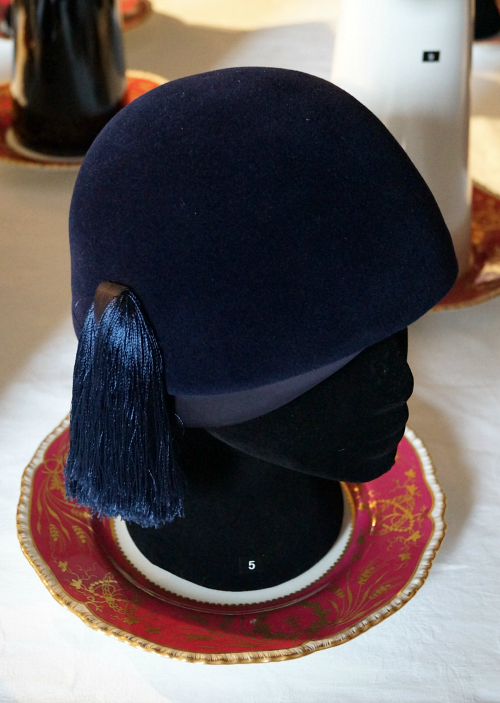 This blue velvet hat with tassel was an original 1920s hat (I think the only one). So simple, but so elegant. The same design appeared later in green. I assume they made a copy to match a different outfit, in this case a driving coat. This was a "Hey I know you from Pinterest" hat for me. Such a simple shape, with such well-thought-out trims that create such a stunning effect. It was great to see it in person and close up. 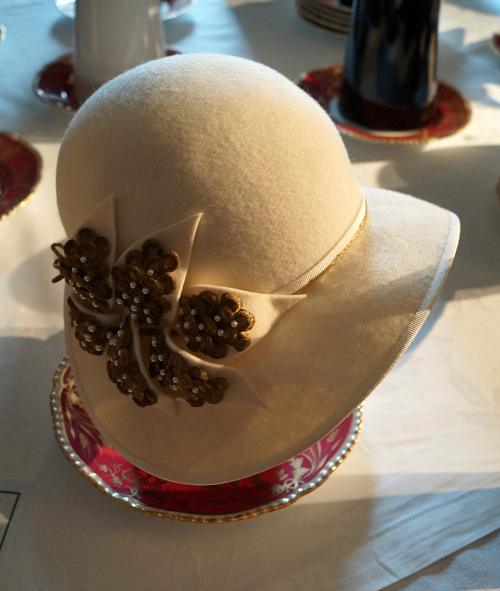 This cream cloche features vintage bronze trims. This is a colour combination I wouldn't have thought of, but that works so beautifully that I might have to get some cream felt! I just love this bathing suit and beach wrap. It's just the level of coverage I like for the beach myself! And the belt is such a lovely detail. 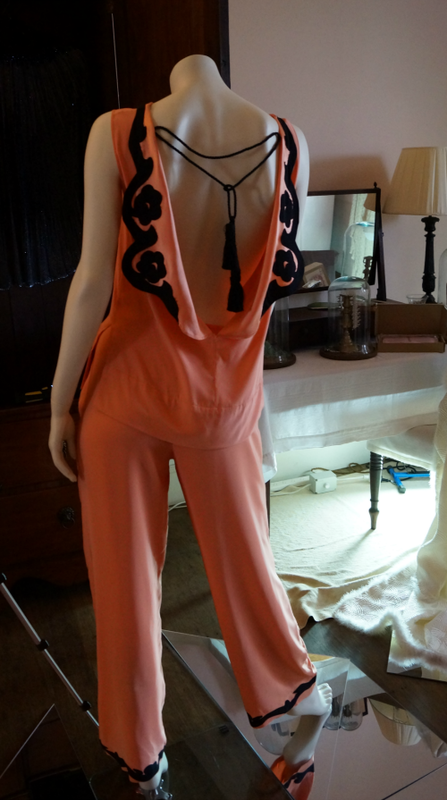 This was new but made from an original 1920s pattern. The hat was revamped with the raffia embroidery. I think a pair of elegant pyjamas or a lounging outfit is something I have needed in my life for a while. And I adore apricot and black together. Nevertheless, I managed not to steal them. 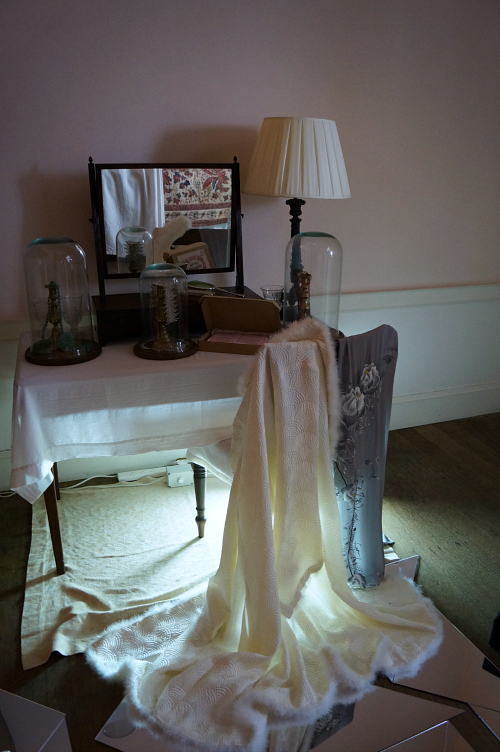 One of the extra-lovely features of this exhibition was the way the displays were put together to complement the setting and to create a sense of place. The building and its furniture are beautiful already, but I was expecting just some rooms with dressed mannequins in them. Instead they were arranged into groups, sometimes by theme, and placed among the objects in each room in a way that brought it all together. The clothes became part of a scene. 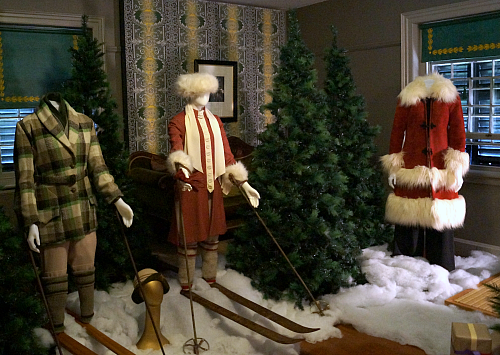 You can't go wrong with a Christmas room. I think I may need a cute ski outfit like this before I can be convinced to go skiing again. Or just a nice outfit to sit around sipping hot chocolate in. Naturally I took more photos, but I think that's quite enough of them! The exhibition is open until June, if you are in the Sydney area (or almost, like me). My hat-making journey began with fancy dress costumes, cardboard, glue and staples. Then my sister gave me a book on constructing hats. It was largely from a theatrical perspective, based on the skills it taught, and the section at the back of basic headdress types and patterns for them. I started making things just for fun, just to learn how to do them. 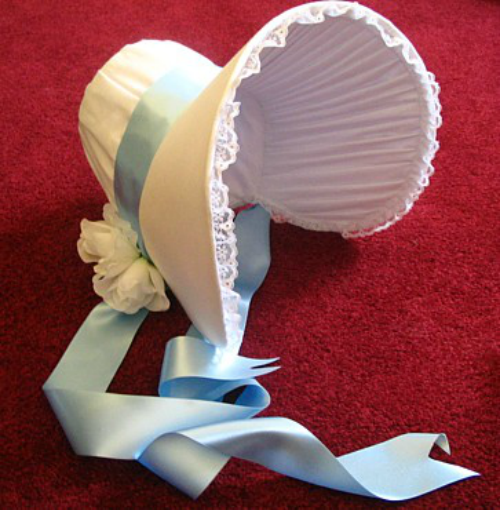 One of the first things I made was this bonnet, in a regency-era style, with a buckram foundation and a nice plain white cotton. It has a pleated facing that took me hours, and a button on the crown that I hand-covered with the white cotton fabric. There was no event that I made this for. I had no plans. It was purely for the enjoyment of the challenge of making it. Over time, however, events came up. 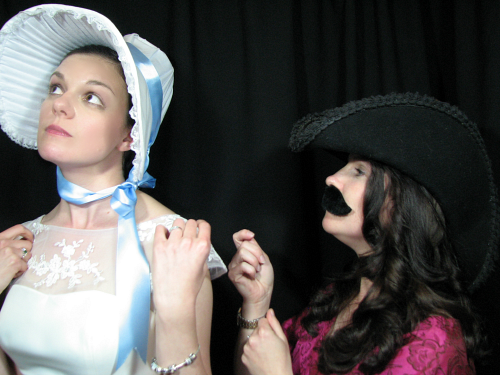 It has been to a regency ball in Canberra (although I only carried it), a Jane Austen High Tea in Katoomba (with my friend Sarah), and it had a heck of a time partying in the photo booth at my wedding. It's been an exciting life for a bonnet. The buckram is dented in places now, but it still looks pretty from a distance. 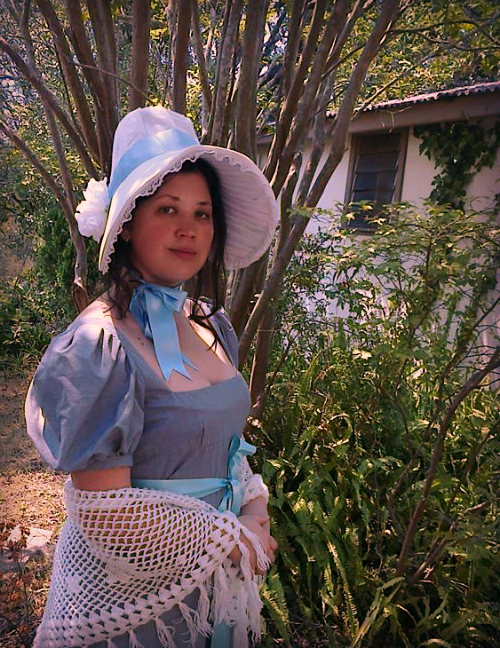 For Australia Day, I took it to Wattle Flat Crafts (our co-operative weekend shop in the old courtroom at my grandmother's house) with some other old historical costumes of mine, for display. The bonnet has sat there with the costumes ever since, until the other weekend when a woman asked to buy it! I'm so happy with the end of my bonnet's story. The woman owns a chest of drawers that has a 2 hat spaces at the top - one for a top hat and one for a bonnet. The top hat has been there, with the otherspace empty all the time, waiting for a bonnet to come along. And my bonnet came along! It reminds me of "Johnny Fedora and Alice Blue-Bonnet", a charming old Disney cartoon that we used to have on VHS as part of a Disney Channel Valentine's Day special. I couldn't be more pleased that after an exciting life of adventure, one of my earliest pieces has found a loving home in such a charming setting, alongside a smart top hat. I hope they get along. Ever since I bothered to learn how to record TV shows on our hard-disk-drive-thing-dvd-player, I've mostly been checking the TV guide for noon and midnight - the classic movie hours. Lots of lots of recorded titles still await my perusal, but I made sure to watch the 1960s ones first, in the hope of some hat inspiration. Since I watched them, I thought I'd share my thoughts with you. This is just the kind of classic movie I love. Implausable but entertaining plot, unlikely but witty dialogue, and charming characters. Accidental divorces and marriages, demanding children and crazy parents form the core of the plot. I enjoyed it immensely, and I'd recommend it happily to anyone else who likes their classic romantic comedies. "I don't want a glass of water, I want a divorce." Isn't this an amazing hat? It's a style you see a lot in the 1950s actually, and that brings us to something that is heavily highlighted in this movie - the generation gap. 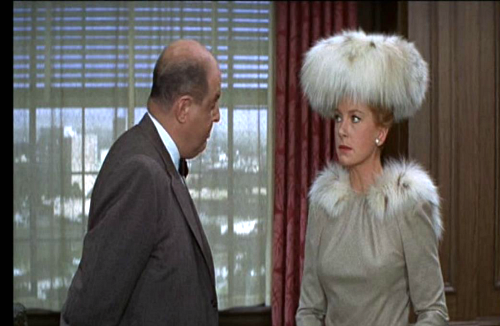 Val (Deborah Kerr) wears gorgeous fashions and looks stunning in them, but they do reflect the clothes of the previous decade strongly. Meanwhile daughter Tracy (Nancy Sinatra) wears younger styles, and hair ribbons, bands and bows instead of hats. The generation gap shows in more than fashion. Val and Ernie (Dean Martin) dance at a club, and look quite uncomfortable but do their best to keep up with youngsters around them while Dan (Frank Sinatra) gets his clapping-along corrected by another club patron. "Does this look like an apron?" "You turned off the fight!" "You won't miss it. There's going to be a doozy right here." 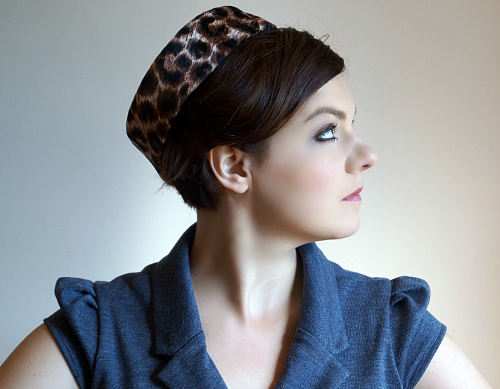 This polkadot turban is divine! It's on my mental to-do list. I was hoping to make it (or something similar) as part of the 1960s month, but other things took priority, and I knew I could visit turbans in a range of earlier eras. Have a look at the original trailer on the TCM website and keep an eye out for this one. I had high hopes for a movie about a young fashion buyer on a trip to Paris for the couture shows. And as far as fashion goes, it doesn't disappoint. Beyond that, I can't say a lot in its favour. It had its moments, but at other times I was just rolling my eyes. I found the main character pretty unsympathetic, and there was one out-of-the-blue song, and a couple of almost-as-out-of-place dance numbers, I think inserted because the actress could sing and dance, rather than for any benefit to the movie. So let's just talk about the fashion. This movie unquestionably focuses on the higher end of the fashion spectrum, and everyone in the movie dresses extremely well. 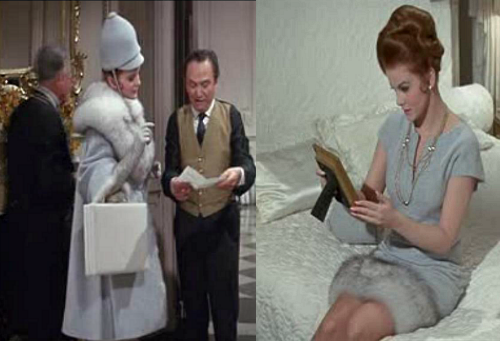 My favourite outfit by far is the pale grey wool ensemble worn by Maggie Scott (Ann-Margret) when she arrives at the company apartment in Paris. A tall grey helmet-hat with strap, and a grey coat with fur collar. Underneath is a grey sheath dress with fur trim at the hem. 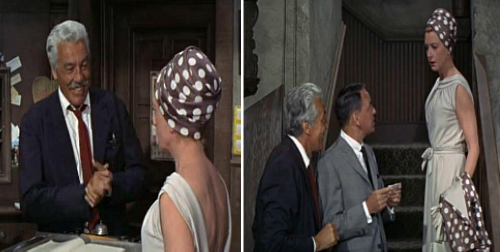 The fictional fashion designer Marc Fontaine (Louis Jourdan) is central to the plot, but we only see a few outfits from one fashion showing. There was a lot to enjoy in these scenes though. Marc's comments to Maggie as the show is in progress are revealing and entertaining. "Don't buy it, it's only for the fashion magazines. It'll photograph beautifully, but it won't sell." "The average buyer will be foolish enough to order it in colour. They give the women credit for very little taste." Not just the models but the audience wear some lovely hats in the fashion show scene too. While you don't get a close look at most of them, you do often get a 360 degree view, and it's a fun source for little sparks of inspiration. If this movie turns up on your TV screen one day, it's worth a watch, but I won't tell you to go chase it down. 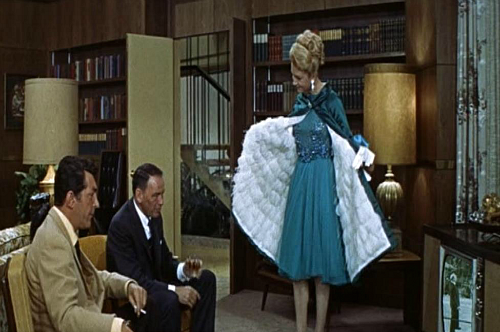 You can watch the trailer at the TCM website, and they also have a promo video with actor Richard Crenna that includes some of the fashion show, costume designer Helen Rose talking about the clothes and showing some of her sketches, and footage of Ann-Margret's wardrobe tests. Airing on Australian TV at the moment is the drama series Love Child. Set in Kings Cross in Sydney in 1969, it follows the struggles facing the unmarried pregnant teenagers staying at 'Stanton House' until they have and give up their babies and try to return to their former lives. Naturally it's not that simple. I watched this show without high hopes, because anything seriously hyped by one of the commercial channels usually disappoints, but I've been enjoying it a lot. Not from a hat standpoint, I must admit. The only (non-uniform) hat I've noticed is on Patty's old-fashioned mother when she comes to visit, be racist, and leave again. The fashions, makeup and hairstyles are fun though. They are young, bright, and casual, really representing the other end of the spectrum from the above movies. Most of the characters are teenagers from middle-class backgrounds, there's a lot of bold colours and patterns and mini dresses. I don't know what the future of the show will be, but I think it's worth a watch if you're in Australia. You can still catch some of the episodes online too, not sure if you have to be in Australia to do so (probably). One of the things that has fascinated and frustrated me in my vintage hat research has been the variance between different sources. Finding images and having to work out where it fits into my schema of the fashions of the time. This fashion magazine image - would anyone normal really have worn it? 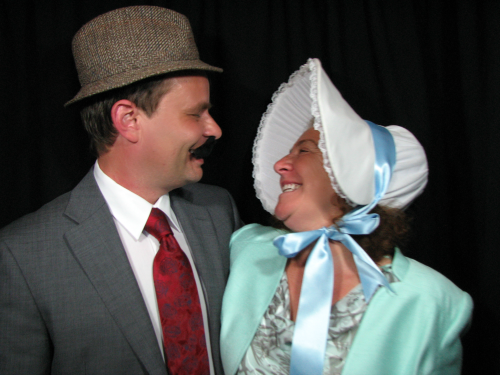 This everyday photo - is this person actually on-trend and up-to-date or are they wearing something old-fashioned? This couture piece - was this even ever meant to be worn by a regular woman? And if so, who would have worn it? Celebrity? Middle class? Mature? Young? Sophisticated European lady? Country NSW famer's wife? 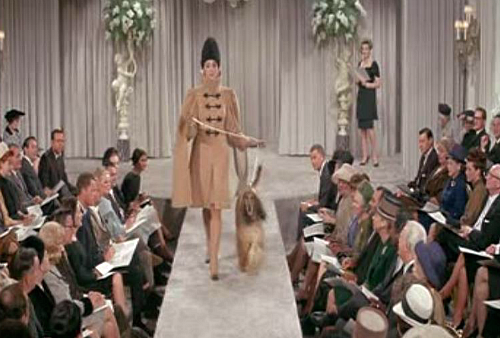 These movies and shows were great at showing fashions, but in very different ways. Love child shows mostly younger, cheaper, more casual clothes from a city far from the centres of fashion (but it's also a modern interpretation, so even then, I'm trusting their costume designer). 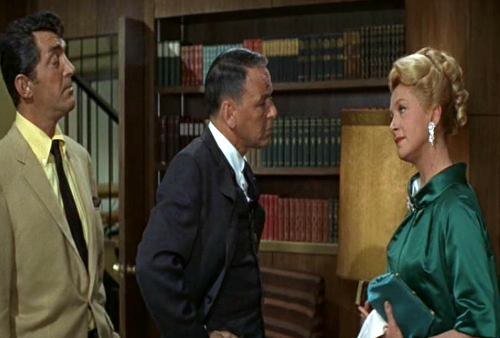 Marriage on the Rocks show mature and young fashions, but still a high-end Hollywood version. And Made in Paris is all high-fashion, no mucking around with the everyday woman, whatever her age. I'm going to be making a change to my original plans for the Hats of the Past blog series. These things always develop differently to the way you expect. I'm removing the arbitrary restriction of one month for an era. The 1960s will either finish next week or go on for one or two posts more (depending on what I make), and the 1950s is definitely going to take longer than one month. This will not only give me time to cover all the styles and stories I want to, but also make me feel I can fit in time to do a few other posts and projects when I want. The 1950s is not far off though, the research is going swimmingly, and I even have some family stories to share. It's hard to know how to describe this category of hats, the tall hats that sit back on the head, covering pulled-back hair. Whatever you call them, I fell for them pretty hard! They appear primarily in "high fashion" photos, and on women like Audrey Hepburn. I haven't seen them in photos of everyday women, and I haven't seen many vintage hats for sale in this style either. I assume they didn't spread much further than the couture photoshoots, but perhaps I have just been looking in the wrong places. My research sources are primarily British, Australian and American, and they may have been a more popular style in mainland Europe. 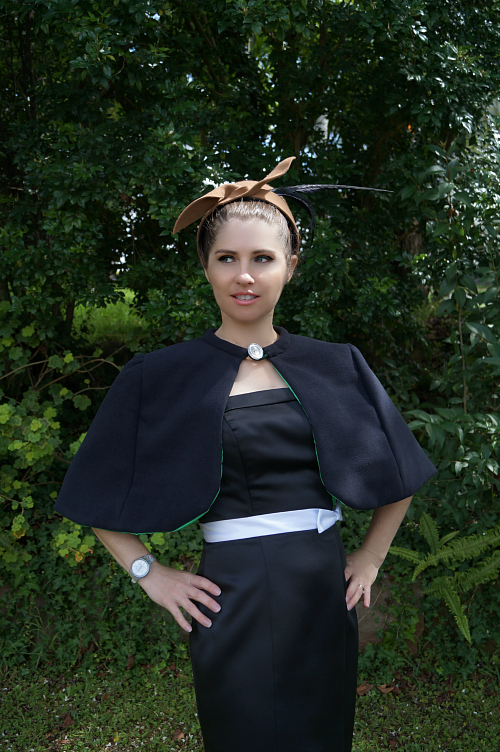 This first one is of my own design, based on a few elements from different sixties hats. When I saw a hat with a "bubbly" outline, I knew I wanted to try to recreate that look, and my "block" (vase) lent itself well to this shape and style. It's in red wool felt, trimmed with cord and wool felt. In the middle of making this hat, I hadn't decided on trims yet. I was walking past the Victory Theatre in Blackheath (an old cinema that is now an antique centre and cafe - and a lovely place!) with my groceries, and I had a feeling I should go in. Upstairs in the vintage fashion section, in a glass case, was a 1960s hat. It was a different overall shape to this one, but it was felt with ripples like this. The ripples were trimmed with black cord, and it had two pom-poms dangling from the top. I decided against pom-poms in the end, but I used the cord idea. You can see that I needed a model for this hat, since I am lacking in the feature required to wear it - hair you can put into a bun! This is my beautiful and extremely stylish (and very dear) friend Ruanne, who appeared in the last post (and you will be seeing her again). I'm getting to point where I'm making enough hats that calling them by their descriptions is becoming tiresome, and since I am looking at so many vintage sources, I've decided to follow their lead and name some of my hats. This one is called "Giana". The second hat is a copy of a design that appeared in a British Pathe video from 1963 of Italian Women's Hats. It's very important that you look at mine before you look at the inspiration, though! It was this video that guided me to Italian names for these two hats. This one: "Alessandra". This is a camel-coloured wool felt with black pheasant feathers. An extra band of the felt makes up the decorative twist at the front. I'm almost at the end of my old store of pheasant feathers, and I've never had any of the scale that appear on the inspiration hat! They are massive! I will say that my interpretation is a subtler, more wearable and practical version. 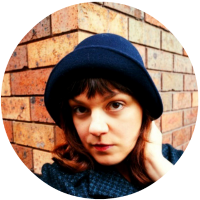 I often play with photo filters, but don't used them much on the blog (apart from black and white) because I want to represent the hats as they are. I couldn't, however, resist the lovely colours brought out by this one (and it's still pretty close to the original). British Pathe is one of my favourite places to look for hat inspiration. The benefit of seeing the hats in motion, from lots of angles, on a model, and often with the colours and materials described by the narrator, is unbelievable. 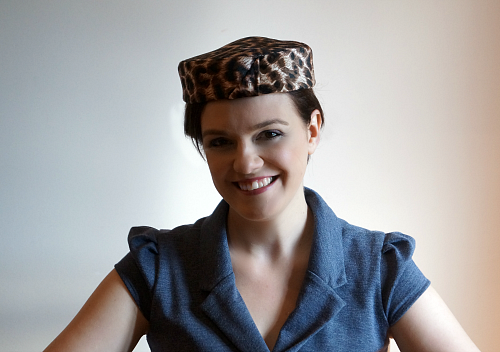 This won't be the last Pathe-inspired hat you see here! Are you a British Pathe fan? Do you have a favourite video? 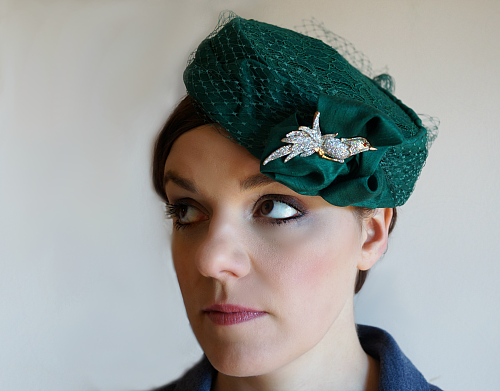 This post is part of a series "Hats of the Past: A milliner explores history." 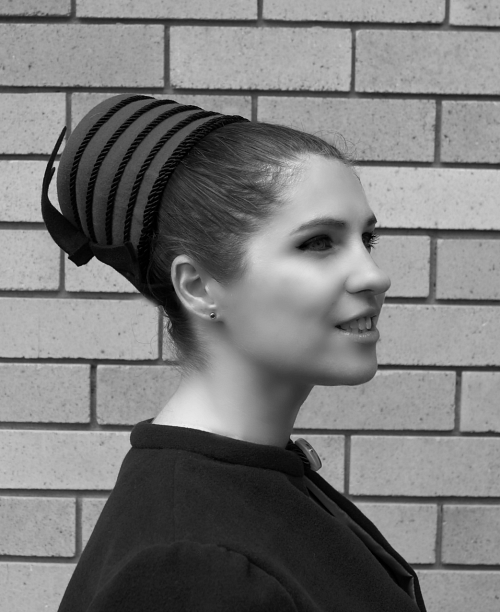 Previous posts are my first impressions and changing ideas about sixties fashion, a look at sixties style of fur hat, an exploration of pillboxes, and a look at the state of millinery in 1960. Oh and both of these hats are up in my online shop. 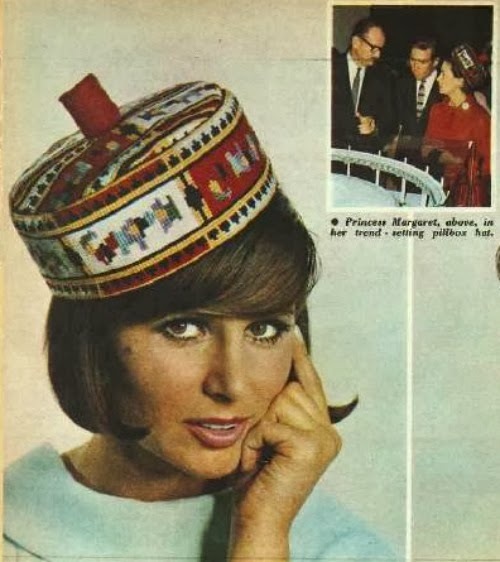 I've long thought of the 1960s as the decade when everyday hat wearing stopped being the norm, and I think most people, looking back on it, would agree. There was still plenty of hat-wearing going on, and distinctly new styles appearing, but you also see a lot of photos of women without hats. That's real life photos and fashion photos alike. So it was with surprise and curiosity that I read what the early 1960s thought about the situation. That women haven't been wearing hats for the last two decades! Business for milliners has been bleak and many of the little guys have been put out of business. “ “The last time hats were universally worn was – oh, 1939. Just before the war,” said Mrs Joy Butler, public relations officer for the Millinery Manufacturer's Association. The article touches on a few elements of the 1960 fashion situation that I feel the millinery world continued to wrestle with for the rest of the decade. 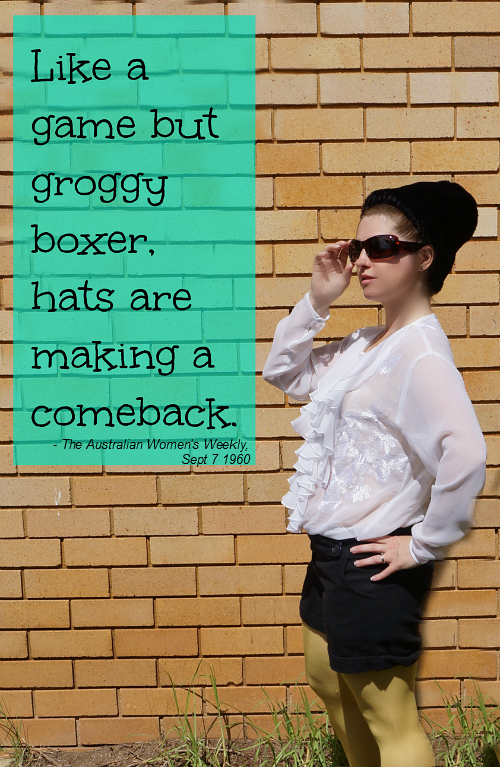 The attitude of the 'youth' to hats, which they associated with formal occasions and church. 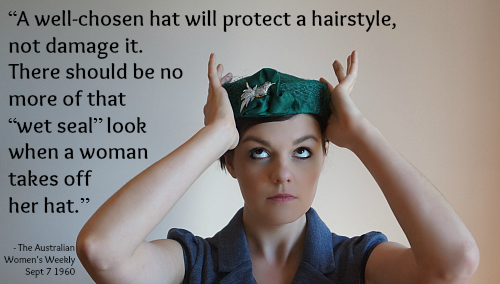 The relationship and sometimes battle between hairstyles and hats. The value of convenience, and hats you can just pull on or put in your pocket. 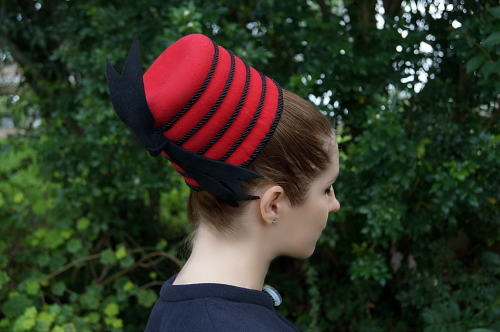 It was also interesting to note that the Melbourne Cup was already separating itself from the regular millinery fashions. Mrs Butler remarks that it is a place for “extreme” hat fashions, unsuitable to regular wear. From what I've seen of photos from the Cup in the 1950s newspapers and magazines, styles worn then were still very much in line with mainstream fashion. So it may be that this divide was just starting to begin in the late fifties and early sixties. 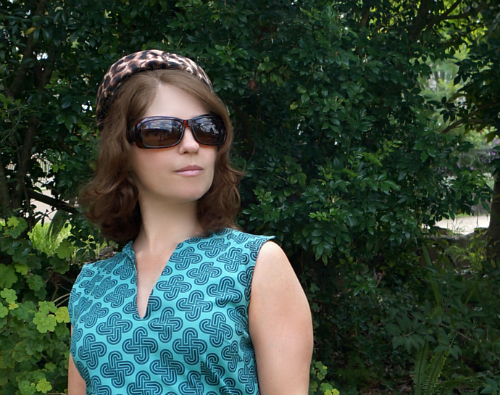 Yesterday I had some serious fun doing a photoshoot with Ruanne, who was able to pull together some amazing sixties looks, despite not considering that she had much sixties at all. One of the main purposes of the shoot was for some hats I haven't shown you yet, for which longer hair was a requirement, but you'll have to wait until next week for those! We also had fun with the fur hats and pillboxes. Get ready for some serious elegance from this lady in the next post! 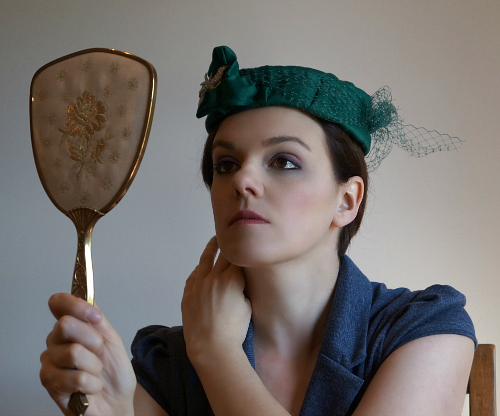 This post is part of a series "Hats of the Past: A milliner explores history." 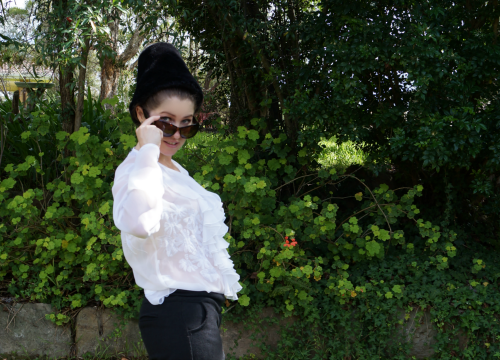 Previous posts are my first impressions and changing ideas about sixties fashion, a look at sixties style of fur hat, and an exploration of pillboxes. 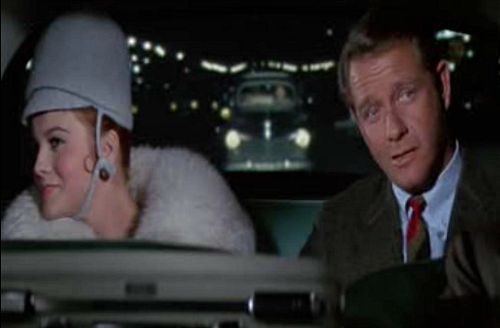 I have a white vintage hat that I've always described as my "Jackie O" hat. My mother described it that way (and other people make the same comment). I was pretty sure it was 1960s, because it's quite high, and looks best on the back of the head. It's not a clean crisp pillbox shape, but it is in that sort of family. 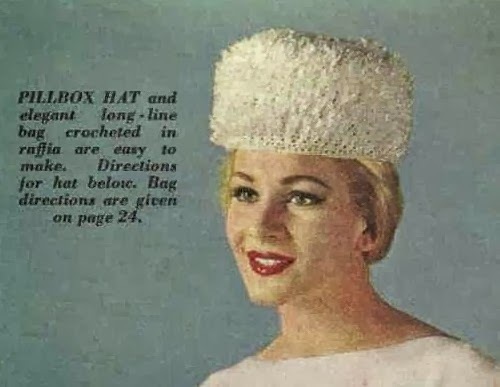 I am, however, going to leave more talk of that hat until next month, because I found almost the exact same hat in a 1950s issue of The Australian Women's Weekly, so I'm revising my original opinion! 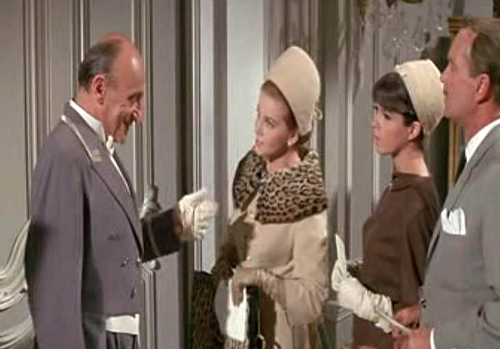 Regardless, pillbox hats as worn by Jackie Kennedy and Audrey Hepburn have long defined 1960s hat fashion for me. So I definitely wanted to make a couple. A pillbox is really anything with a basically cylindrical shape - straight up-and-down sides and a flat top, and no brim. Being such a simple shape, it's been around for centuries in some form, and has produced so many variations of style. 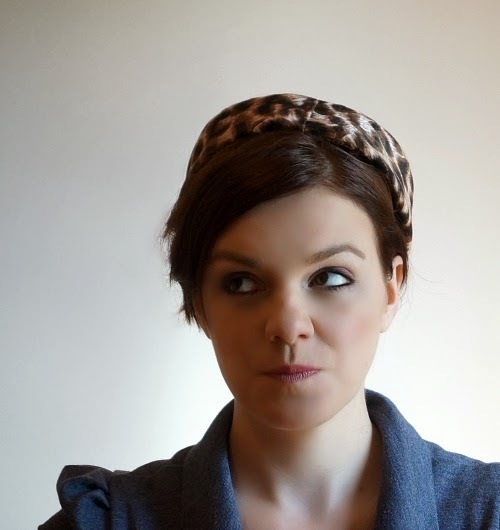 Even if you stick to one foundation shape, the ways it can be covered and trimmed, and the ways it can be worn, make it an incredibly versatile and variable hat. In the 1960s, the pillboxes get taller than previous versions, but the variety continues. Veiling is an especially popular trim, and used not just as a veil, but for surface design wrapped around the fabric of the hat. The fabric is often swathed around the foundation for a hint of turban style, and pillboxes completely covered in feathers or flowers are also common. For Audrey and Jackie, the plain, unadorned pillbox remains, with only the height separating the early fifties from the late fifties-early sixties style. 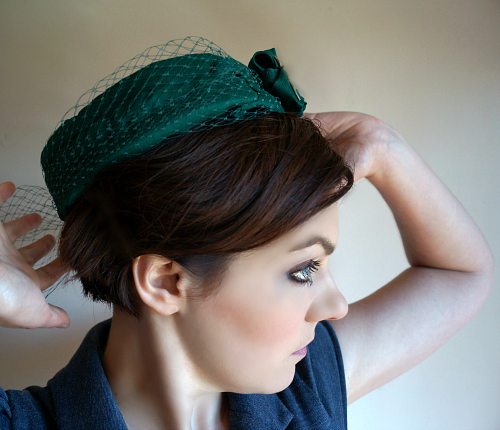 Let's look at the ways of wearing a pillbox. 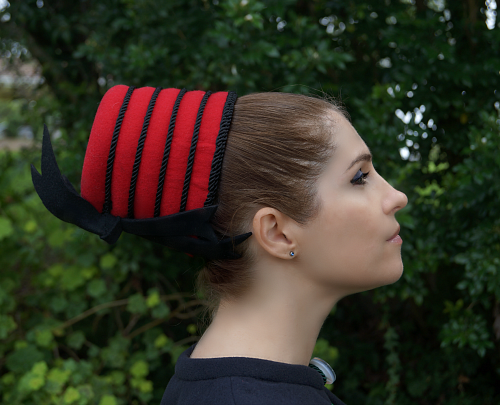 These days, I'd expect the pillbox, like most hats, to sit forward on the face, and to one side. 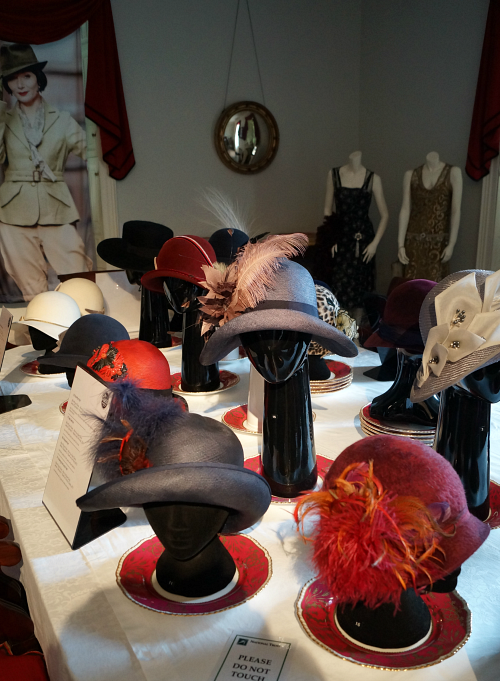 Modern millinery is very focused on this way of wearing hats, and most are designed with this in mind. In the fifties and sixties, you don't see it as often, but it does appear, as in this photo from The Australian Women's Weekly (5 Jan 1966, pg 16). You'll notice, though, that the inspiration for this look, Princess Margaret, is wearing it back on the head. My grandmother Wendy recalls wearing a black pillbox hat with veil in the 1960s, and wearing it straight on the top of the head. 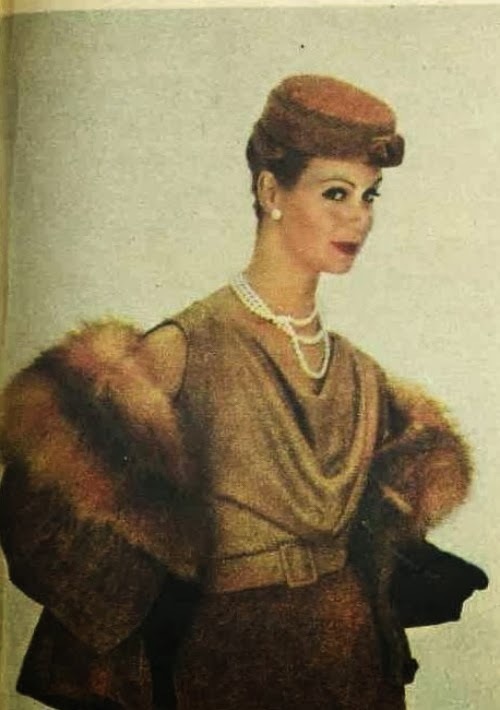 This is also still popular, as in a fashion spread from The Australian Women's Weekly (22 June 1960, pg 29), showing a suit to wear to the theatre, and a lower-crowned pillbox style, and another from the 15th of August 1962 issue (page 21) for a higher crocheted pillbox. Audrey and Jackie's iconic looks have the pillbox towards the back of the head, and this style is also seen in fashion shoots and on everyday women, and other celebrities. 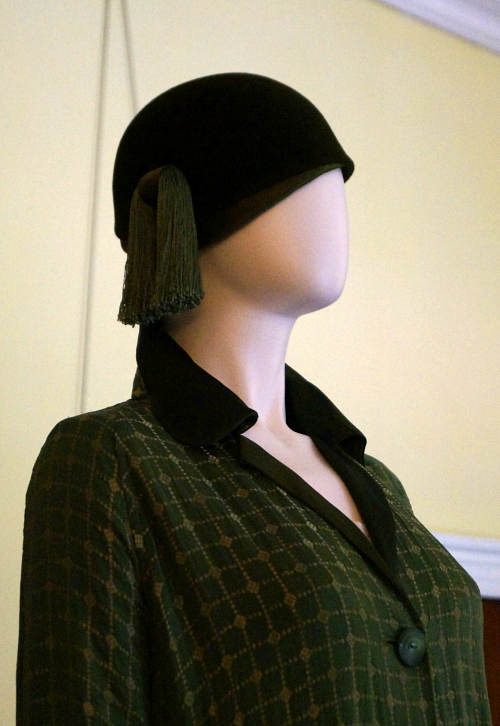 The same tapestry pillbox worn forward on the head above is also shown back on the head, and is inspired by one worn by Princess Margaret, who wore it back on the head. 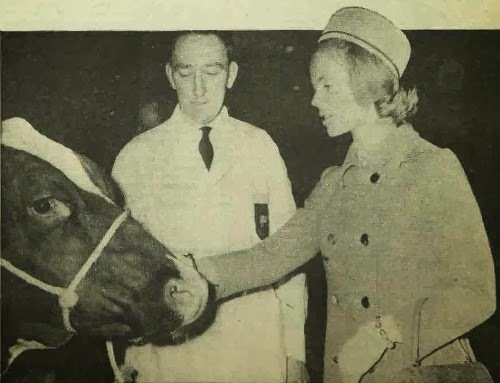 Here's a lovely photo of the Duchess of Kent wearing a pillbox this way, while patting a cow (AWW Nov 20, 1968, pg 11). 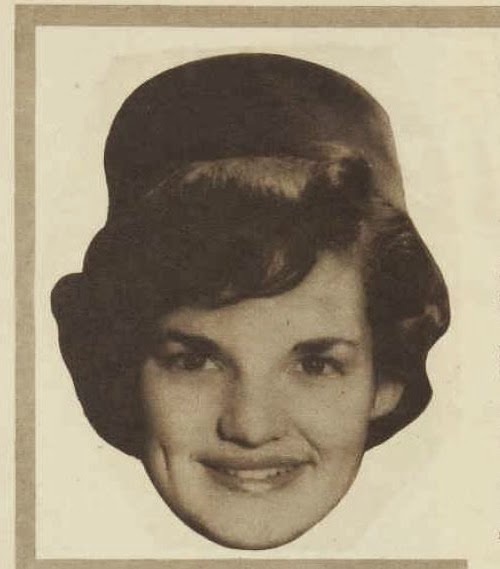 The Jackie Kennedy obsession was pretty serious in 1964, based on an article (AWW, 12 July 1964, page 4) about getting "The Jackie Look", which includes instructions for a "Jackie" pillbox hat and for her hairstyle, and this photo of a "double" for Jackie, who is actually a 17 year old girl from Randwick who does clerical work. The article opens with: "By wearing it often, Jackie Kennedy has set her seal of approval on the pillbox hat. 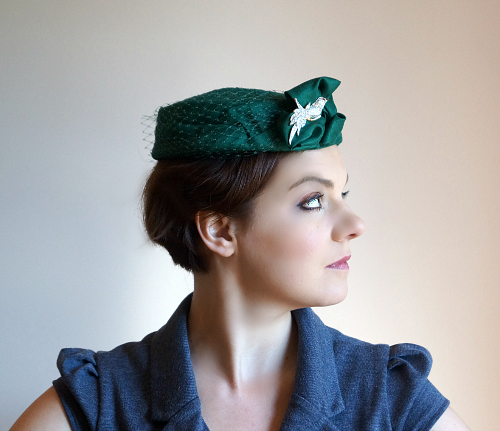 The pillbox is youthful, chic and very pretty - and it's a hat that anyone can make." 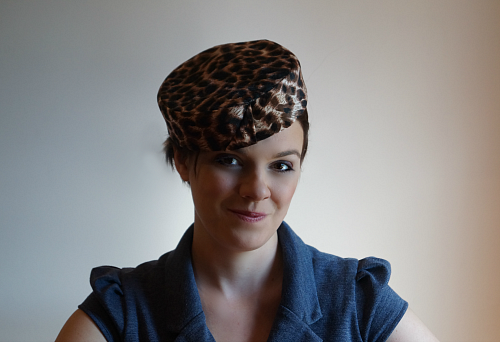 Under your brand new leopard-skin pill-box hat"
It’s your brand new leopard-skin pill-box hat"
What styles of pillbox do you like and which way do you (or would you) wear them? 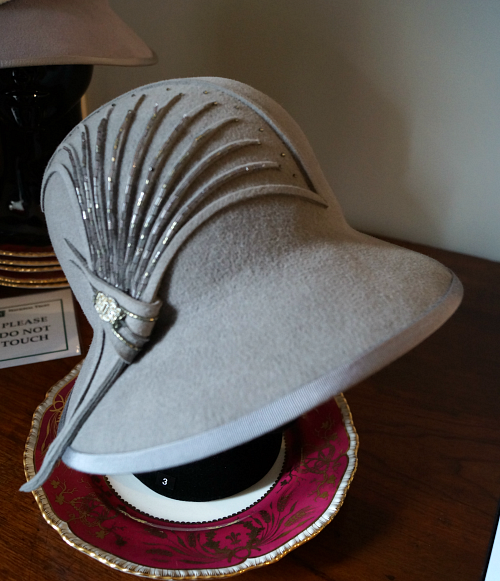 This post is part of a series "Hats of the Past: A milliner explores history." 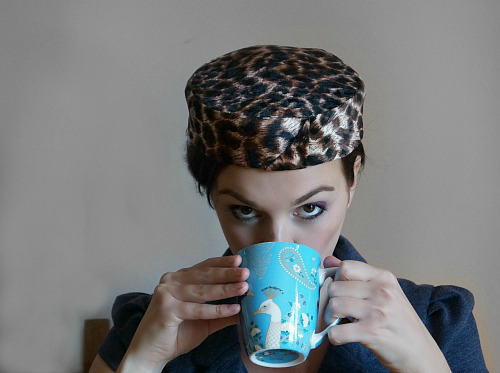 Previous posts are my first impressions and changing ideas about sixties fashion, and a look at sixties style of fur hat.